As the chapter begins, Marcus will be visiting the grave of Carl. You’ll be given a series of choices for dialogue Marcus can say to the gravestone. Pick any of the options that come up, there will be about four decisions that appear, and watch the cutscene play out. Eventually, Marcus will leave the grave and pass by Leo, heading to a church where all of the androids have taken refuge. Inside the church, you’ll be able to move around the area and talk to everyone. You’ll have to speak with Kara and Connor, with Marcus apologizing to Kara and deciding the fate of Connor. Walk to Kara over in the center area and speak to her. After the cutscene, walk to Connor and talk to him too. You’ll be given a choice to trust him or not, pick the option to TRUST Connor and there will be a discussion between the two. Next, move around the church and speak to each one of your teammates from Jericho. Josh will be next to Connor and Kara’s location, while Simon will be on the opposite side of the church. After speaking to both of them, walk over to North in the center and speak with her. You’ll have a series of choices for dialogue to ask North about. After about two choices of dialogue, the two of them will have a brief moment before Marcus gets up. Walk over to the center of the church and begin speaking to the crowd there. Marcus will have to make a big choice for what to do next in the wake of the events at Jericho. You can choose to either march peacefully and have a demonstration to the humans, or launch an assault on humans to liberate the androids and spark a revolution. NOTE: At this point of the game, if you’ve made bad/machine like decisions with Connor’s story and had a bad relationship with Hank, a cutscene will play showing Hank commit suicide. If this happens, YOU WILL NOT get the good ending of the game. If you don’t see this cutscene during this chapter, you’ll know you’re still on the path towards the best ending. Whichever choice you make greatly affects the Public Opinion you have. For the Good Ending, make the choice to do a peaceful DEMONSTRATION. This will have Marcus make a speech to everyone in the area, which will affect some of the relationships you have with different characters. The speech will go through towards the end of the chapter. The final chapter of the game begins with the president addressing the nation about the events happening in Detroit. During this sequence, you can choose to take any of the questions that appear with the prompts on the screen. Whichever option you choose won’t have any effect other than describing some of the events from the previous chapter. You’ll be able to take about four questions from the crowd before the president leaves and the scene ends. After the previous scene, you’ll see a cutscene with Connor going to the CyberLife tower. 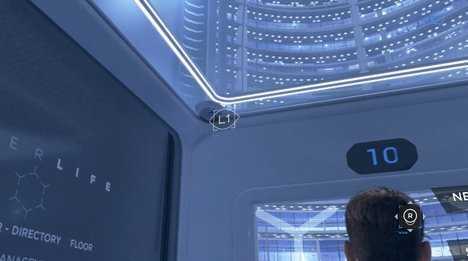 After the cutscene ends, you’ll be controlling Connor and will have to follow the CyberLife guard onto the elevator. Follow him through the building until you enter the elevator. When you are waiting with the guards, you’ll have the chance to make a choice of how to deal with the situation. Before anything else, look above to the left and scan the camera. 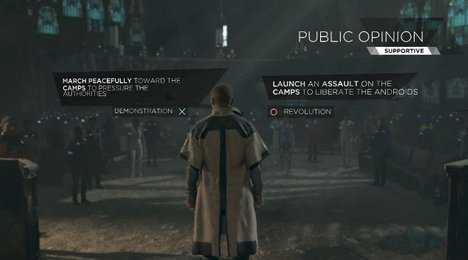 Hit the prompts to hack it and disable the camera feed, doing so will prevent another action sequence that can kill Connor later in the chapter. Next, look at the guard on the left and pre-construct your actions, which will have you disable the guard. Look over to the right guard during the preconstruction and scan his waist to kick him. Once you scan everything, hit the prompt to execute the action, you’ll have to hit the prompts through the sequence to be successful. Once they’re down, look at the elevator controls and examine it to change the destination. When given a choice, pick the option to use the AGENT 54 VOICE to change the location of the elevator. A cutscene will play out and then you’ll switch control over to Kara and Alice. Copyright © 2014 - 2019 SocksCap64, All Rights Reserved. Logos, Trademarks, Pictures Belongs To Their Respected Owners. Powered By WordPress. 68 Queries in 0.414 seconds.